In mid-February I spent a wonderful afternoon with Chef Andrée Riffou of C'est bon Cooking who I met care of a food event at the end of January hosted at Ottawa's Urban Element (sponsored by the Chicken Farmers of Canada) through her marketing person, Paola St. Georges who I had met through Twitter! It turns out that since Chef Andrée completed her Grand Diplôme at Le Cordon Bleu Ottawa (including one semester at the Paris school) in June 2009, she was given the opportunity to judge exam dishes, and ended up being a judge in November 2009 (therefore, judging my exam dish…blush!). She welcomed me into her beautiful and well-equipped kitchen for an afternoon of cooking. 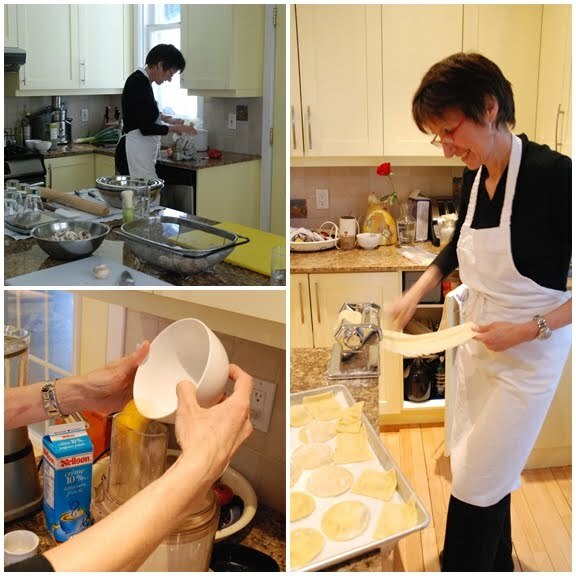 She has started a new food business in Ottawa: Cooking Classes, Food Tours, Team Building & Training Activities. I was there to help test her menu and timing for an upcoming team building session. The menu included mushroom soup, ravioli and panna cotta. In-between all the discussion of cookbooks, school, chefs, Paris experiences and burn tales, we cooked. This dish was one of my favorites of the afternoon, and I decided I needed to reproduce it in my own kitchen. Although at school we would have made it by hand, I used my food processor to mix the dough and my pasta maker attachment for my Kitchenaid to roll the pasta. 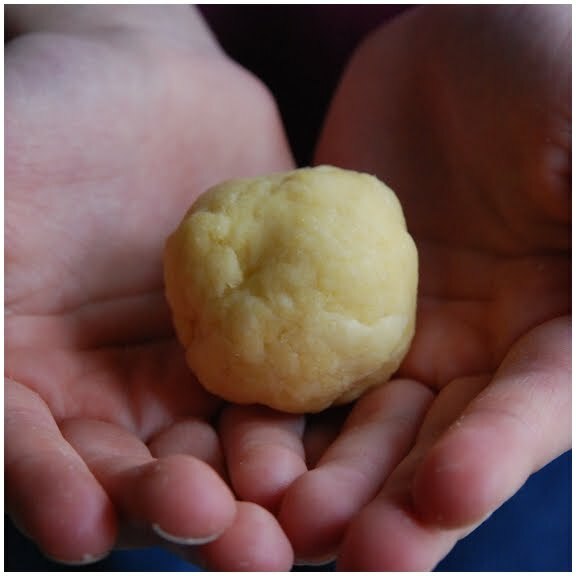 I even re-processed left-over dough in the pasta maker, which is likely a no-no at school! For the pasta: In a food processor, add the flour and salt. Then slowly add the olive oil, water and eggs. Add more water if necessary, until the mixture forms a ball. Let sit in the refrigerator for about 20 minutes. Roll or use a pasta maker to form into sheets. Sauté the finely minced shallots in butter until translucent. (This step is optional.) In a sauté pan, toast the pine nuts. (This step is optional.) Let the shallots and pine nuts cool. 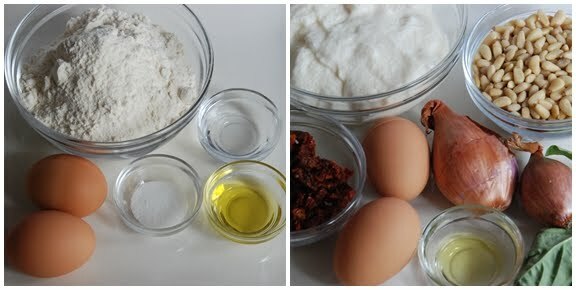 Mix the Ricotta with the minced sun-dried tomatoes, eggs, and basil. Add the cooled shallots and pine nuts. Season with salt and pepper to taste. Fill the sheets of pasta with a spoonful of filling. Cut with a knife or cookie cutter. 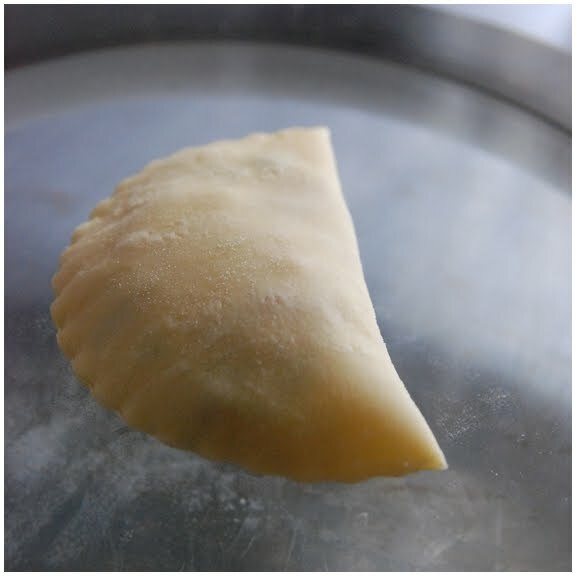 Seal well and place on a floured cookie sheet to dry. Reduce the white wine until reduced to about 1/8 of a cup. In a separate pan, reduce the cream with the garlic and basil until reduced by half. Mix in the wine and keep the sauce warm. Boil water with lots of salt. Cook the ravioli for about 5 minutes. Tomatoes, shallots and cheese, how could you go wrong? It looks like a very deliciously educational day. mmmmm...Your ravioli sound so flavourful and delicious with all the gorgeous ingredients. i've never made my own ravioli, but when (if...) i do, i want it to be filled in exactly this way. what beautiful work, shari! Such beautiful little pasta pillows! 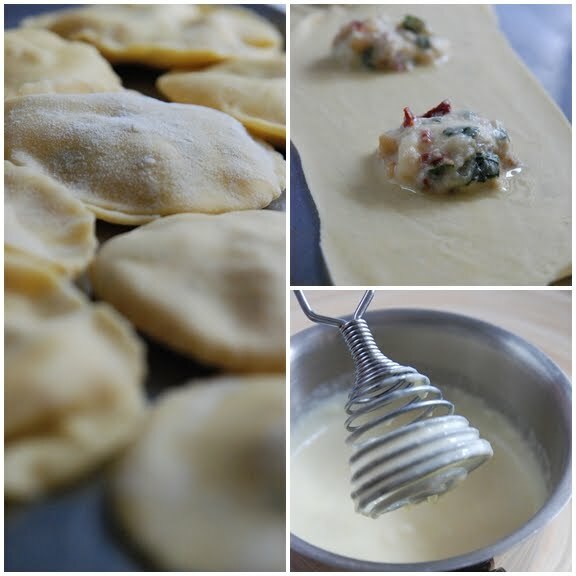 Makes me want to make some ravioli myself... And this recipe doesn't seem like it would be so hard to veganize... Oh, my mouth is watering just thinking about it! oh my goodness! Sounds delightful! Great post! Not only look and sound yummy, but I love the step by step pics!! These ravioli look amazing. You can't go wrong with the flavor combination either. What a beautiful, perfect pillow of goodness! This is a beautiful recipe. If I shee shallots I hang out just a bit longer. Ooh, all those flavors sound so good--and homemade ravioli. Yum! These are beautiful, and that filling combo - wow! I really need to get the pasta attachment for my KitchenAid. Wow, that recipe looks so delicious and beautiful, too. The filling sounds amazing. Love the idea of adding pine nuts! This has to be one of my favourite dishes! Made so much easier with the "step by step" photo's, excellent! Great looking ravioli! The words "pillow-like" comes to mind. Oh wow these look good! I love that there's pine nuts in the filling.